I’ve been using this, as well as the “model 15” for a while now, and still surprised of the sound quality that these apps have. Animoog is one of the most inspiring sounding tools I have in my huge arsenal of sonic love. Joe Solo - Record Producer for Macy Gray, Shiny Guns and many others. So it gets one star because until I can use the app and not have to force quit my iPhone X, it really doesn’t deserve a higher rating. I just downloaded this for $2.99. It is an amazing app! Love the sounds. This is also my first software synth! Animoog, one of the best, just got better! Now with more vitamin A(udiobus). Great with a Fiio adapter! Straight out of the i-device DAC into a stereo splitter, into 2 line ins panned left/right. Sound quality is outstanding!! Fantastic, fun, educational, and MIDI! I'm an app junkie and this is one of my favs. The kids love it. You can tweak sound like a real moog / analog synth. But unlike other apps, it has a visual orbiter feature (so cool) and midi support (but you don't need midi to have fun). Plug into external amp and get funky. Seriously a great app, guys. Many apps that are great for professionals have counterintuitive controls that take exhaustive setup. They also produce flawed-sounding output with amateurish inputs, understandably, but not so with Animoog. There is very little that cannot be created as a base idea and then refined. I have gotten some really weird sounds that rise in pitch after you release the key. Hasn't played well with MusicStudio on a very brief Audiobus run, but no complaints. A breeze to export to Audiocopy and looking forward to producing a full suite of sounds to process on other apps. I'll give this a higher rating if you can update this with the scale lock functionality. It's so much easier to keep jamming on a loop this way. Thanks. Not only does this App do amazing things, but the developers really pay attention to the users. I submitted a feature request that was promptly replied to. The feature was included in the next release. Fantastic! Opened app, made a sound, plugged in headphones, no output, unplugged headphones, no output. 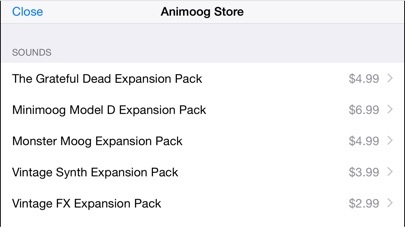 All the stuff I bought for the iPad version wasn't transferable to the iPhone platform. Maybe I'm missing something simple but seems a little strange. Great app though... Couldn't live without.. When I attempt to audiocopy a sound, a screen pops up stating that audiocopy only supports 44100hz... I checked my settings & all is good on my end. Please fix! It's Animoog. Of Course It's Good! 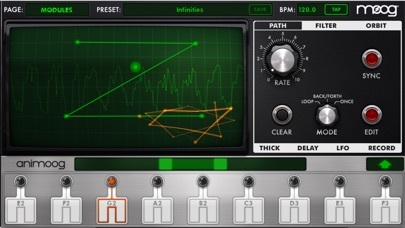 Like it's iPad counterpart, Animoog for iPhone is excellent. Why less keys on iPhone5? I love this app, but recently I got a used iPhone 5 and proceeded to install Animoog on it, but was disappointed to find that despite the larger screen compared to my iPhone 4s, for some reason there are less keyboard keys when using this on my iPhone 5. How odd. And the keys are spaced apart much more than on my iPhone 4s too. I looked through the settings, but that doesn't appear to offer a fix. I guess I'll have to keep my older iPhone around just for Animoog, since the lack of keys makes this iPhone 5 version way worse. This is as close as you'll get to holding an entire Moog synthesizer in the palm of your hand. Even if you barely understand how it works (like me), there's a lot to discover, learn, and enjoy by poking around the settings. Great synth, as is the iPad version,but I would suggest making iap's shareable with the iPad version because I bought all the iap's for the iPad version and to be honest, I have no intention of buying them again for the iPhone version and I doubt others will, so stop the greed, I already bought the iPad version, the iPhone version and all the iap's for the iPad version, cut us a break!!! 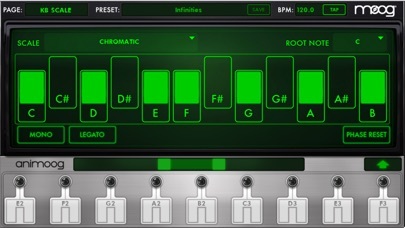 This is the best synth app on ios, but even after the ios 9/ iPhone 6s update, the app still crashes in audio bus. it's made by MOOG - what are you thinking? get it! there's so much to this app that once you realize how the X Y screen function - and how you can alter and create new functions - you might just forget other responsibilities in life. both the iPhone v and iPad v are great (but the iPad v has a true 4 track that's an in-app, but if you wait till around Xmas - maybe you'll get it for free - maybe). yea there are bugs, but anything this great is gonna have constant ghosts in its machine. if you're looking for a mini Moog or Modular 55, etc. this is NOT it. it's it's own thing for the mobile device era. I would have given it a 5, but then I found out that none of my in app purchases will be restored on my other device. Using "different experience" as an excuse to double-charge for every preset is not what I'd expect from anything that made it through app store vetting, and certainly not what I'd expect from moog. Not universal, not even IAPs! Really Moog? I bought the iPad version last year. Just bought this one for convenience. Making me buy two copies is one thing, but not allowing me to restore the patch purchases I made is really slimy. Animoog is capable of some fat sounds, its keyboard is brilliant, and its easy to experiment in a very intuitive way. I find myself using it a lot for liquid, legato soloing, but you can sequence it for some nice bass sounds as well. I've used it on two albums now, and that's a testament to its power. Drawbacks: I bought this on iPhone, and now have to pay full price again for the same app on iPad? Come on. Only company that does this, I think. MIDI as an in-app purchase is also a bit much. Also, there is a strange metallic sheen to all the sounds on this synth. Record anything and try some EQ spectrum analysis, and you will see a normal gentle roll off in the highs until you get to about 16 K, where there's some strange loud spike from there to 20k. This is true even when playing bass sounds. This can be fixed in post production with a high shelf EQ cut, but it makes me wonder what the developers thought they were doing when they included this. It makes for some very piercing sounds. The Arturia synths or Thor sound much warmer. I like the synth and its overall fun and amazing but.... Moog, stop being lame about IAA. It's useless without being able to play right into the pocket DAW's. Such a shame companies go 3/4 of the way to a prefect app. Sooo good! Tons of fun - one of the best synth Apps of all time! Ridiculously good / fun for cheap. This is a very wonderful app. I would happily drain my battery on it. But there's a problem. The control knobs that run the synthesizer are glitchy. They are hard to turn with your finger or thumb and they don't readily stay in place. Frustrating. If that can be addressed I'd recommend this app to anyone ! Hopefully, iOS 8 support won't take years. Used to be the best, but Magellan is better in my opinion. At some point in the last month, or the last update, not only have I lost tons of presets, but I've lost almost all of my timbres. When I try to "Restore Purchases" nothing happens even though I'm told it was successful. To make matters worse I'm also unable to change ANY timbres. Not my generations moog! If these problems get taken care of, I'll do another rating. My very favorite synthesis app, a lot of useful tweaks: all the scales (modes), presets as examples (InApp addOn), visualizer with controller, et al, symbiotically offering that original "knobs-and-sliders" immediacy to playing where it's intuitive and almost autonomous to reach out and adjust, knowing what will happen or be happily surprised by the results. With an iPad version, external midi USB keyboard (plus Apple adapter(s)), and you're set for months of hours long Jam sessions. Record, save, share (iOS 8), read the tutorial, & enjoy. There's no one way to do synth, but this does Moog well, has been out for years, and keeps working. Did I mention it sounds awesome? A diverse palette from expert designers. Can't go wrong. It gets five stars for sheer sonic power. One little thing though is that recent updates have made it almost impossible to delete a single path point. Very annoying! And support has not responded to my email about this. Also, I know the 4 track from the iPad version is probably out of the question, but it would be nice if we could get a "record on input" function for the recorder so it starts recording as soon as you press a key and fixed recording lengths as well 4, 8, 16 bars or something. It would make it a lot easier. Bit of a learning curve, but cool. Patient and responsive support, too! Animist is as good as it gets when it comes to analogue synthesizer sound in a digital package. Killer app!! I am using it to create sound effects and background music for a movie/video, and it works fantastically! I am not a musician, and I do not play an instrument, but the touch controls for the app on the iPhone work so well and are so fun to use that even with total music ignorance, I can still get great sound effects and ‘music.’ Thanks for creating the app, and making it affordable. Highly recommended! Another update and Animoog for iPhone is still not working in Audiobus for me (current versions of everything). Frustrating, as the functionality is supposed to have been around for over a month now and is yet to work. It works fine on its own, but produces no sound when used in Audiobus, with an "error" appearing over the Animoog icon in Audiobus. I love Animoog, but I need it to work how it's supposed to...with Audiobus...and won't be using it, or giving a review with more stars until it does. Get it together, Moog! Thanks for the update. Running great! But when are they going to add the HOLD button for iPhone? Such a crucial, simple feature. It's a tiny button on the iPad version, can't you just add it to the iPhone real quick?! I had this app on my iPhone 4 and it worked great. It was a ton of fun and I couldn't wait to try it out on my new phone with a bigger screen and louder speaker. So far, I've been disappointed. The audio quality on the app is very poor on this new phone and software. I suspect they need an update to the app to communicate properly with the new audio card. Please update us soon! If possible an Ableton link update would be Fantastic PLEASE? I shoulda rated the app sooner bought on my iPad and iPhone and the in app purchases and they have been maintained a top notch an constantly improve. WORTH IT! Thanks an hopefully new artist/Ableton packs? Not enough keys to make music with, but sounds good. I have this for iPad and love it, but you only get one octave to play with and you can't expand the range like you can with the iPad version. Really excited to download this app and start playing, really disappointed with bugs , once open it disables the main speaker and sends all audio out the ear speaker, also have to toggle the background audio setting to get any patch other than the default to sound. Hope to get update or resolution soon. 6s plus. Moog get it together please! Perfect app! Incredible! Worth every penny! Please update for iPhone X and when you do, you'll get that fifth star. Because really the app is perfection. 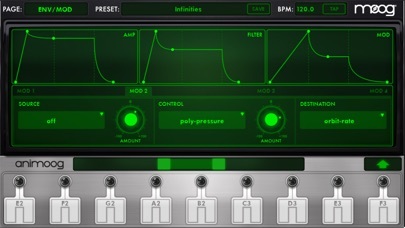 This is just a stupidly good synth app. It’s the only one I use. With that being said, please update for the iPhone X.